When it comes to keeping up with the techno-slang, I fall way behind. These days when I log onto social media platforms I have to keep Google open on a separate tab so that I can search the meaning of these words that might as well be a foreign language to me. But ever since I came across the term FOMO and discovered what it actually stands for, it was as if someone had turned on a switch in my mind. 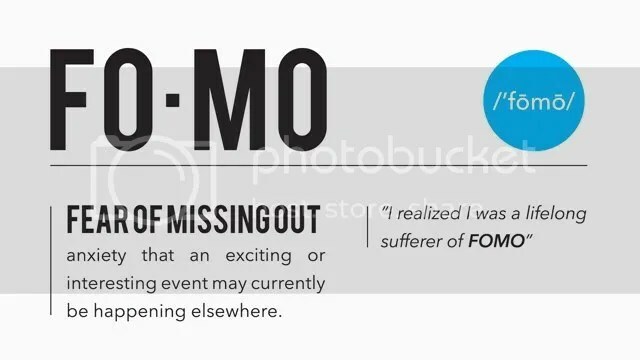 Since this is a term being thrown around so often these days, I gather FOMO is a very real occurrence in today’s society. I have no doubt that it’s a result of our exposure to other people’s lives through social media. It can be so easy to fall into the trap of questioning your life plans when you see someone else doing what you wish you could be doing in that very moment. Last week I was feeling so blagh, I wanted to get out and do something fun. But I ended up wasting so much time moping that I let an entire day pass me by and I could get nothing done. At about 5:30 that evening the husband took me for a drive up Signal Hill, and even though it was a short outing, it did me the world of good to get out and see the beauty of this city I call home. Sometimes we get swept away by the life we are trying to build for ourselves that we forget to live the life we want. 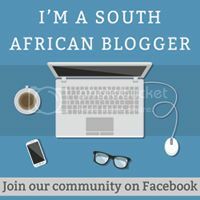 I am sick of the FOMO!! I prefer to enjoy the spur of the moment drive up Signal Hill on a misty Sunday evening with my favourite person in the world; instead of dreaming about the end of year holidays. Yes I am excited for the holidays, but I don’t want to wait until then to have some adventure, I don’t want the days in between to go by uneventful. After all, Happiness is a journey not a destination. Exactly!! And you don’t need to travel to the most beautiful places to create memories, you can do it at your footstep. Allah has created beauty everywhere. It depends on how you decide to view it and cherish it. So true… There is beauty all around us – there is no need to go to a different country or continent to see all the beauty of the world. Taking little trips around your own town can open your eyes to so much possibilities. We are so blessed Alghamdulillah! Hi Ayesha, so glad to see your name popping up over here 🙂 I know that everything gets so incredibly hectic, it has been that way for me too (even more so) lately. But when I am at work I can’t help think that there has got to be more to this! If all we do it stress and worry and work then what is the point? There is SO much beauty in this world that we should be seeing. Getting out and relaxing makes me feel so much better and I feel like I have accomplished something even more than what I do when I meet a deadline! You need to break away from time to time and do something that you can look back on as you get older. I am aiming to do more of that – I don’t want to work my life away and let LIVING take a back seat. I think you’ve got it spot on… I’m considered young and I still have a hard time trying to keep up with the latest trends and things happening in this fast-pace world. Spontaneity is something that is always guaranteed to add little drama and flare to your life. love it! Thanks for the heads up what FoMo means, I wouldn’t have known it otherwise. And you are right, life is now, not yesterday and not tomorrow. Omg I thought I was the only one?! I hate the idea of missing out! But you are right there’s nothing better than being spontaneous and doing something. I read this post and my first thought was STORY OF MY LIFE! Especially the mopping around part and hubs taking me for an evening drive. So relatable! Omg what can I say except for STORY OF MY LIFE! This post was spot on for me and so relatable! I hate the idea that I’m missing out on what’s happening outside my door but at the same te being spontaneous is so exciting too! Great post as usual! Sorry for not being around much…your girl is in the middle of a move to a new city. I’ll save that for a blog post if you’re interested but just know I’m reading your blog! Awww Saf, always a pleasure seeing you on my side of the www 🙂 I am happy you could relate, I think so many of us are secretly going through this. It is something that we can only overcome by getting out there and doing SOMETHING. No matter how small, experiencing something new and different is a fantastic pick-me-upper. didn’t know what FOMO meant myself, until a few months ago!